You haven't seen a raise since the Great Recession hit the country, and you probably feel overdue for a salary bump. But when is the right time to ask your boss or supervisor for a raise? Does your timing play a role in whether you're likely to nab that paycheck boost? It sure does. 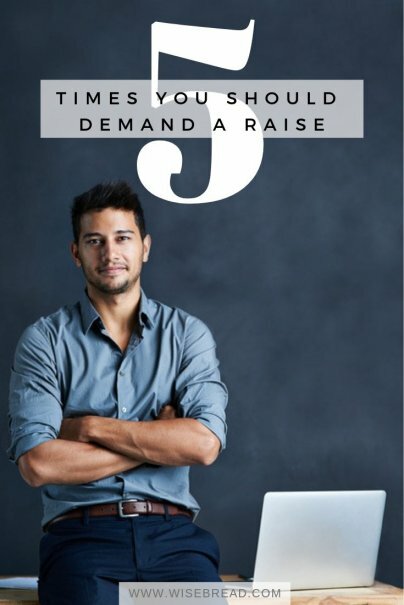 Here are five times when you should demand — or at least ask for — a raise from your boss. Have you worked on a new advertising campaign that has increased sales at your company? Maybe you've recommended new technology that has saved your company thousands of dollars per year. If you've done something that has either boosted your company's revenues or cut its expenses, there might be no better time than now to ask for a raise. Just make sure to remind your supervisor of the benefit you've just brought your company. And if your boss refuses your request for a pay raise even when shown this evidence? Then it might really be slow going to get a raise at this company. Maybe your boss asked you to land three new clients this quarter, but you brought in five. Or maybe your supervisor asked you to create a new video promoting a product in three months and you wrapped your work in just two. If you've not only met, but surpassed, a big goal, it's time to ask for a raise — especially if you do so consistently. Your goal when asking for more money is to show your employer how valuable you are to the company. You want your boss to know that the extra money you're requesting pales in comparison to your value. The best time to prove this is when you've exceeded your boss' expectations. There's something appealing about negotiating from a position of strength. If you've gotten a job offer from another company, you now have an advantage when it's time to negotiate a raise. Don't be afraid to tell your boss that you've gotten an offer from another firm. Tell your boss, too, that you'd like to stay put, but that you'll need a salary bump to do so. If your boss doesn't want to lose you, the odds are good that your raise will be forthcoming. Be careful, though. Only threaten to leave if you really are willing to accept your new job offer. And don't ever bluff your boss by pretending that you've been offered another job. This could backfire if your boss refuses your request for a raise. If you don't have that fallback job to turn to, life can get pretty awkward around the office. If your boss asks you to train a new employee, it's a sure sign that your boss respects and appreciates the work you've done. Your boss thinks you are talented and knowledgeable enough to mentor a new worker. Now that you know this, there are few better times to request a raise. Remind your boss that you are taking on a new responsibility by training an employee and that you'd like to be rewarded for it. Maybe your entire company isn't raking in the big dollars, but your division or department is thriving. It's actually growing and generating an ever-increasing amount of profits. If this is the case, you can ask for a raise confidently even if your company isn't having a record-setting year. Remind your boss that you are an integral part of the company division that is performing well. And offer evidence that your work is part of the reason for that success. No matter when you ask for a raise, make sure that you come armed with concrete reasons why you deserve the paycheck boost. It's not enough to remind your boss that you haven't had a raise in five, seven, or 10 years. You need to convince your boss that your performance is boosting the company, and that you're too much of a valued employee to potentially lose over a $5,000, $10,000, or $20,000 raise. How have you successfully asked for a raise? Share in the comments below!